At long last the wildly popular series My Little Pony: Friendship is Magic (from the Hub network of course) comes to DVD thanks to Shout Factory on the 28th of this month. 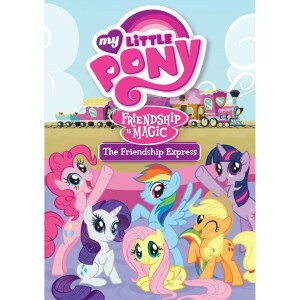 My Little Pony: Friendship is Magic — The Friendship Express will include five non-sequential episodes from seasons one and two of the series, including the premiere episode parts 1 and 2, “Over a Barrel”, “Hearth’s Warming Eve”, and “The Last Roundup”. You can order a copy on Amazon, and any number of other places too, of course. If you’ve been on another planet and have no idea what we’re talking about, check out the latest incarnation of My Little Pony on Wikipedia and find out why so many adults have gone crazy for it! Oh my gosh, I'm sooo excited for this.